Despite the almost inevitable FIFA 19 not receiving any official announcement or specific platform confirmation, it appears that a Switch version of the game is firmly in the minds (and therefore development) of the team at EA Sports. Speaking to DreamTeamFC, FIFA 18 producer Andrei Lazarescu has spilled the beans on how the newest instalment will run on Nintendo's console. Unsurprisingly, the game will be running on the same custom-built engine as Fifa 18 did before it, but players can expect to see a boost in graphical details as the studio learns from, and gets to grips with, the new engine. Lazarescu then went on to note how some of these improvements are already noticeable in the recently released World Cup update - which has been causing some trouble for some Switch users since its launch. Added crowd features such as face paint and hats "seem better than what you’ve been used in the core version" he said, adding that "we’ll see more of that in the next years". Hopefully, as EA Sports further develops these Switch foundations of the game, we'll start to see nice touch-ups that steadily progress the series on Nintendo's platform. While the idea of FIFA using some of the Frostbite Engine's technology seems very unlikely, Lazarescu doesn't want to rule that possibility out entirely, stating that he's "not closing the door on that possibility, however we didn’t want to create a dumbed-down version" of it. We will, of course, have to wait and see what the game looks and plays like when we see an official announcement from EA in the future. Until then, though, what would you like from future FIFA entires on Switch? Let us know your hopes and dreams down below. Interesting. Wish I could remember everyone who said Switch wasn't getting another FIFA. I never expected this announcement to come and if it did I foresaw a Wii U style situation where they just pumped out last years game again with a new number. So colour me impressed. Seems this little shoestring budget team EA handed this off to is very passionate. I mean you could see that simply from Gamescom where Nintendo kept showing the game off and the team were so giddy at what they had accomplished. I'd like to shake their hands I can say that. Good to see this confirmed, hopefully Madden and NHL will be next. Maybe EA is actually seeing they can make money off of Switch games by actually making them good? No doubt FIFA 19 was coming. Sales were solid for switch. Their recent update told me they were still invested in the Switch. Why even bother giving free content if they didn't want to continue to show support. I think its better in the long run to have a custom engine anyway. Isn't it better to have an engine that is specifically suited to a console rather than forcing a one fits all engine onto a system it probably isnt suited to. Great news! All I really want from the next FIFA is improved graphics,better animation on the walk ons,replays etc and a better transfer system maybe. We already know it'll have the UEFA license which will be a huge addition.Cant really think of anything else.I've no interest in The Journey Mode so couldn't care less about that inevitably missing the cut again. I knew there was something else,add Celtic Park ,Ibrox and Hampden for god sake. They've had 26 years or whatever it is. @PanurgeJr that literally made no sense whatsoever. Thankfully it can lay to rest until next year when I'm sure it'll resurface with FIFA 20. @NewAdvent It's number 1 in the UK Eshop charts just now. I'm sure its highest position before was 3rd. The 66% discount and new World Cup mode has certainly helped. @OorWullie I report on the UK eShop every week and one thing I notice is those retail sales we get every Monday? Yeah they dont paint the picture AT ALL. You see games lighting the Switch eShop on fire here but in stores, meh. 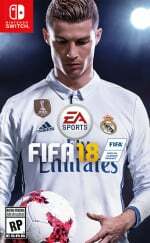 I’ve just bought fifa 18 having never played a fifa game I had no idea where to start. Started career mode and didn’t know how to start a match 😱 had to google it😳 confusing menus when not accustomed to them. So, EA will consider FIFA 19 for Switch. Well, that means EA can consider The Sims 4 for Switch + All DLC contents. @YummyHappyPills The difference is that Switch actually has traction. I do understand your statements that this wouldn’t come - especially after EA abandoned Nintendo after, what, two or three game releases?! I am glad to see they are building on the foundation. I can’t think of any inherent abilities the Frostbite engine has, for this game, that couldn’t be replicated on their new engine. I feel like there is a little bit if a cop-out there. Maybe I don’t know enough about the stuff that was cut from the Switch version to understand, but I don’t see how story cutscenes require Frostbite for a soccer (sorry, football) game. @NintendoFan4Lyf I wasn't even basing it on EA's past actions. I was basing it on EA saying "FIFA 18 needs to sell well" and then retconning that to "We will only consider projects once we see where demand is after a year on sale" and going silent afterwards with no port of Madden, no word to investors and quite frankly showing as much commitment to the idea as a cheater shows his wife. Good to hear. FIFA 19 was always coming to Switch because sales have been decent (AFAIK) but I did half expect a 'legacy' edition with updated resume and nothing else. I'll probably pick up this new entry. I went with NBA 2K18 last year for my random sport game in an attempt to get back into the NBA, but I just couldn't get into it. Shame too, as unlike WWE, NBA was actually a good port. I used to play FIFA all of the time during the 360 days, so I'm sure I'll have a ton of fun with a Switch version! @YummyHappyPills LOL! Well FIFA 18 sales did go up 500% when the Switch price dropped. Maybe that was enough for them to know that people wanted the game, but had work to do to justify full cost. While FIFA 18 was better than the media would have let you believe on Switch, even in terms of graphics, I am disappointed that there is no online seasons mode in the World Cup update. That and I didn't realise how bored I am of FIFA unless playing friends. That's not the game though, it's honestly the best, most fluid FIFA I have played in years so 19 should be great but for me, maximum value is £20. That's for me personally. Delighted. Love FIFA 18 on Switch. Just need to have ability to play online with friends and I'm sold on '19. Definite buy. @sandman89 Head over to the FIFA 18 thread on the NL Forum. Loads of info on Manager Mode there. FIFA 18 was fun, and I'm no sports fan. But it felt very arcade like. @NewAdvent I think EA had an 'Aha!' moment when they put FIFA 18 on sale and realized people were buying it a lot more. Perhaps people weren't willing to pay $60 for a version that lacked certain features (compared to the other systems). So, maybe these lower prices really did the trick. @Anti-Matter You will get My Sims 2 and like it. Makes sense, no point in developing an engine just to use it once and not improve it. FIFA 18 has been climbing the UK eShop chart and is currently numero uno. It's also number six on the Switch physical Top 20, number 23 on the Top 40 Individual Format, unit sales, in the UK. Would never have been interested had it not been for the double whammy of cheap price and World Cup update. And I'm loving it. It's just so polished and playable. The only issue is the amount of menus for a newbie like me. But having too much to do is the kinda first world problem I can deal with. Sales would be amazing if it had online team play.... Bring on NHL please... with EASHL. As long as it gets the modes of all the others versions this time. That's an area where NBA 2K18 excelled. I bought FIFA 18 on Switch this week as amazon were selling it for £20 and figured it was worth that much. •show an actually playable video game. •minus some revolutionary features that were introduced on Wii U. Being able to organise substitutions on the touch screen while playing the game was an amazing feature. Having to pause to substitute is crap. •revealed football, yet again and forever more, as the most boring and slowest sport ever conceived. @garydbz25 that’s just EA dude, and it’s evident in all their sports games on all formats. It’s not an issue localised to this single release on switch. Unfortunately EA are amazing at business, securing IP and marketing.... not so much at actually developing games. FIFA on Switch is excellent! @KingSandyRavage I'm a woman but agreed. EA won't even put NHL on PC so I have no high hopes for Switch sadly. But I can dream. Battlefield V and then I'll care, thanks. @Knuckles-Fajita "I foresaw a Wii U style situation where they just pumped out last years game again with a new number." The Wii U couldn't even get that. It was quite clear that Fifa 19 would come to the Switch, with the great sales it had in the UK/Europe and Japan. Hopefully this will lead to EA considering bringing their other (big) franchises to Switch. @SethNintendo @DrkBndr To be fair EA gave no indication it would happen and publicly stated low faith when moving the goalposts for future support. I was simply basis my pessimism on what info they gave us. And I changed my username to match my new overdue avatar (that is being used across numerous platforms now!) from Sonic Mania Adventures Episode 3 which launched what, 3 hours ago? FIFA...yay! How about NHL 19 on the Switch?!! Outside of Mario + Rabbids, FIFA 18 and Skyrim are the best-selling 3rd party games on the Switch. I never believed that EA would completely drop Switch support, especially after they added to World Cup update to the Switch version of FIFA 18. @Anti-Matter I would love Sims 4 on the Switch. Dont get my hopes up like that dammit. In other words just like they did with PS Vita, different skins, same game. It's still the best portable football game, but this is what I feared would happen. FIFA tends to be minor improvents (if any) each year, so im not expecting any major overhaul from FIFA 18. @Hughesy so by that logic the PS and Xbox versions are just the same game with different skins right? They need to fix Online. People need to play with specific friends and fam. @kobashi100 No because they actually change the way the game plays, not always for the better, but they at least try. Fifa on vita was literally the same game being resold over and over again. Fifa on Switch already plays like the last gen era, so it's already lagging behind in the physics and ai department. The AI are too easy to predict for me on the hardest difficulty, as there's no variety in how they play, that's not what the PC and other current consoles are like. I've still played it to death, as like I said it's the best mobile Fifa game. @Hughesy there's literally nothing in these statements to indicate that this will be the case. Maybe wait for the official reveal first? @Hughesy you are predicting FIFA 19 will have no improvements. This is only the second switch game and because it doesn't have the frostbite headline you are writing off the developers and claiming they won't bother improving on 18. I really don't see where you get this vita example from. I have played FIFA on PS4 and this claim that the CPU has great variety in play is pretty funny. The CPU and lack of variety had been a problem for like 10 years now. Frostbite has not changed that for the better. Genuinely astonished to see people drawing a comparison with the Vita versions from what's been said here. Are we in opposite world? so this is ea support, huh...and that other one with the sounds. The problem you mention re.lack of variety in the AI is very prevalent in every FIFA game. The PS4 version is no different, neither is the previous FIFA I played, FIFA 16 on Xbox One (which is the closest relation to FIFA Switch in my opinion). If you want good single player AI, PES 17 is the king of recent football games. FIFA Switch is lacking some of the graphical finesse of the PS4 version but that's all frostbite has brought to the table IMHO. @OorWullie if they add Tannadice i’ll buy it. It didn't have online play?! Yeah, that is a must have for 19...I play it on the Xbox and never paid attention to this omission on Switch, but that is a gigantic missing piece. After that superbly entertaining CL final, I had a blast last weekend playing with my little brother coop (I'm 41, he's 14!) against others online. I'm sure it must be coming this year, as online play is a must have for that game. I just refer to them globally as the KNOW NOTHINGS. Congrats to those folks for once again living up to their nickname! @Agent721 it has online play. You can't invite friends to play though. @electrolite77 Because EA have form for doing this. Every time a game isn't seen as an equal they just re-release it with minamal effort. Also I have Fifa 17 on both Switch and PS4 and the ai are a lot different, more variety, smarter and don't use the same tactics. PES has awful so imo, I don't mind that game but I wouldn't say ai is it's strong point. @kobashi100 @agent721 Yeah, randoms only unfortunately. Hence I haven't touched the online aspect of the game yet. @MrBlacky I love the accuracy of the predictions around these parts. FIFA 19 still isn't coming by the way, this article doesn't prove a thing. FIFA 18 is excellent on Switch and do not let anyone tell you otherwise out of ignorance. How is the World Cup patch for FIFA 18? I'm thinking about buying a used copy just so I can play the World Cup format. @Morph not really no, you just disable all the features that aren’t supported in your engine for a specific platform. not to mention frostbite isn’t switch only. also if the engine wasn’t closed source or they were using a more public engine the devs would already have experience with it. @Kimyonaakuma to me it doesn’t make sense. both unity and unreal scale just fine on the switch so to me it’s pretty sad that frostbite can’t be made to do the same. @Nintendofan83 The World Cup mode is great,I'm really enjoying it. Looks good,has new commentary and can be customised. There is no 'Road to the World Cup' option though. Makes sense as there are only about 10 more international sides in the game which didn't qualify. @tekknik I think it would be possible but it would just take a lot of work. It was probably easier for EA to just make a custom engine instead of moving the whole of Frostbite. Hopefully they'll bring Frostbite to Switch one day! Of course they will release Fifa 19. All they have to do is go through the game and change all the 18s to 19s and boom, "new" game! It boggles my mind how this is still an acceptable practice. Player lists and rosters should be updated, for free each year, and new features and content should be released via updates yearly. 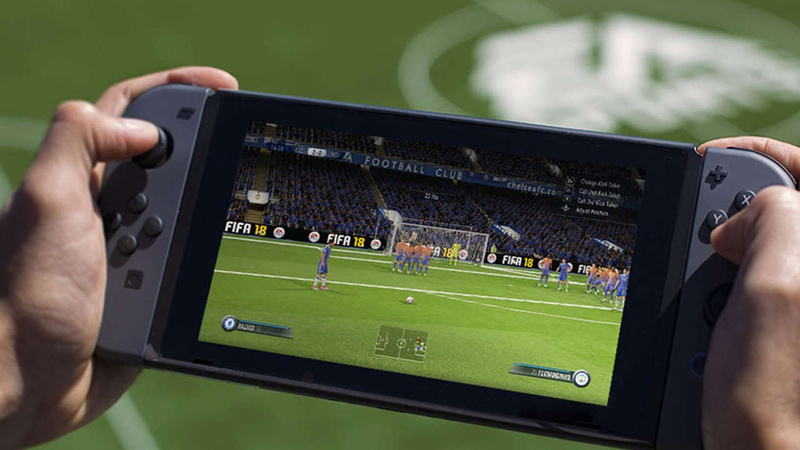 They can release new versions of the physical game, but anyone who already owns FIFA on Switch should just get updates. And for that matter, the same on other platforms. It shouldn't be Fifa 18, 19, 20, 21... It should be FIFA Switch, FIFA PS4, FIFA Xbone and FIFA PC. And of course the same thing for other sports games like Madden and NBA 2k. Speaking of which, is Madden coming to Switch ever? 6-8 player local multiplayer would be a game changer. I don't understand why they're restricting it to just 4 players when the Switch, which is also running on a custom engine, is capable of handling up to 8. No problem with a custom engine but it's not great when there are features missing from the other versions. Surely with 19 we can actually play against friends. i'm not sure why everyone is begging for the frostbite engine, i mean its going to look great and play great so there is no reason to force an engine on hardware thats going to make the game worse off. I'm personally very happy with this announcement, Fifa 18 is great and you should all buy it for anyone on the fence. fifa 19 should at least add the missing ultimate team features like squad battles.. those shouldn't be too complex to add..
Now, after i played Portal Knights Switch, i thought My Sims & My Sims Kingdom Wii were much like Proto-type model of Portal Knights. The idea of create your house, furnitures, etc from My Sims was implemented very well in Portal Knights. I considered Portal Knights as My Sims 2.0 for Same gibberish talk style, similar Chibi looking, Cartoonish world (But better than My Sims), Better gameplay and continuously updates with new features. If EA want to revive My Sims on Switch as My Sims 2 (EA revived My Sims characters as Cameos on The Sims 4 figurines ), better they deliver great gameplay as good as Portal Knights / Animal Crossing. Otherwise, it will be the last thing on my mind. @SethNintendo I only said that to poke fun at the doom and gloomers and kneejerk reactionaries we have around these parts, of which there are ample. Personally I hope they bring more support so eventually I can get a hockey game...I haven't played one since the Gamecube days. I wish they would focus on improving gameplay and tactics instead of unimportant stuff like the crowds. Who cares if they have facepaint and hats?! @SethNintendo No sweat mate. Yeah 2K3 was my last hockey game, but my favourite is still the original EA Hockey on the Megadrive. It played absolutely brilliantly, the later versions all felt much more sluggish and bogged down with stats to be enjoyable, I just wanted more of that slick pass and move game the first one had.